When she started her career in social work and nonprofits, Kris McCracken never thought she would be a CEO. Through the years, she developed a well-rounded background in mental and physical health care, working as a domestic violence crisis counselor, HIV and AIDS case manager and substance abuse clinician. 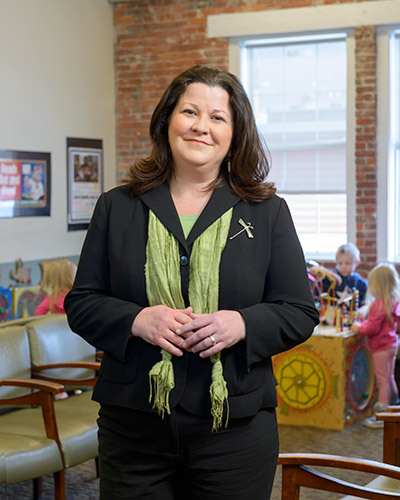 Nearly 20 years ago, McCracken joined Manchester Community Health Center as a crisis outreach counselor and moved up the ranks to director of operations before becoming president and CEO in 2013. Within a year, Kris, her staff and board turned an operating deficit of over $600,000 into a healthy bottom line. Witnessing a changing scene in available funding for nonprofits, McCracken recognized the need for partnerships to uphold community health options. She successfully completed a decades-old mission to join a nonprofit with a similar mission: Child Health Services. Last year, McCracken successfully negotiated a similar partnership with Catholic Medical Center to grow operations of the hospital’s West Side Neighborhood Health Center. But as she says, these efforts are not “a lift by one,” but a “lift by a whole school of sisters” she has worked with for two decades. Q. How did you address the funding challenge for MCHC? A. MCHC was facing funding cuts from some long-time supporters. Many of the community health centers were in a similar situation at that time, and it was before the advent of the expansion of Medicaid coverage in New Hampshire. At that time, approximately 40 percent of our patients were uninsured, and that, coupled with budget cuts, put us in a tough place. It was also difficult from a size perspective because we were a little too big to be small but we had to make that jump in size to reach a critical mass. Those are tough growing pains, and it takes a measure of faith from your board when you’re faced with a complex health care environment. A. My father is a public high school teacher and my mother was a social worker, so the apple didn’t fall far from the tree. I’ve been really fortunate over the years to have support at home, developing an early interest in the field, so that was the starting place, but over the years I’ve been pleasantly surprised by the number of great role models doing this work, in community health and mental health and social services, who have helped me along the path in different ways. I continue to find there are people mentoring me in things I am learning or are not in my wheelhouse, and I’m always grateful to have somebody. You feel like you have struck gold when you meet someone who has that great vein of knowledge and is willing to share what they have learned. A. As best I can. I think we all struggle with that. Work bleeds ever more into people’s lives with the advent of connectivity. I keep expecting my coffeemaker to remind me to return an email that’s overdue one of these days. A lot of people feel stretched, whether it’s behavioral health or social services – the dollars continue to be pulled back and people are looking for more value and more data, so they are constantly trying to change. So it’s hard to feel like you can settle down and catch your breath because we can’t sustain the spending that’s going on in these fields. I don’t want to be in denial for where the field is at, but, from an organizational perspective, we’ve done that growth spurt and now it’s getting the internal stuff to match the depth of the organization. Q. What advice would you give young women starting out their careers? A. I think what would be wise, and should be required when people are in high school and if they choose to continue education, is to help people explore their strengths. It’s amazing to me to see adults – in their 30s and sometimes 40s – who aren’t sure where they want to go. And I’m not sure a lot of people feel like they’ve received a lot of guidance to match their strengths and interests and theirs needs with what opportunities are out there. Nobody does that work with people in a structured way, and that’s important, what you’re going to do with the rest of your life is important, and you have to do something that meets your needs. Is it creativity? Is it helping people? Is it being connected? Is it some level of recognition you need to achieve? There’s no right or wrong answer. It’s just knowing it and owning it.